oh, sweet joy! : sponsorships now available for January! Advertising is something that totally changed my blog and shop from a hobby into a business. It was a scary step to take, but it totally paid off and was so exciting. Highlighting new shops & sharing my AMAZING sponsors to my readers is truly one of my favorite things about blogging and I'd love to have you as part of the Oh, Sweet Joy! family. Nothing is more exciting than seeing small businesses & blogs grow because they chose to take the leap of advertising! 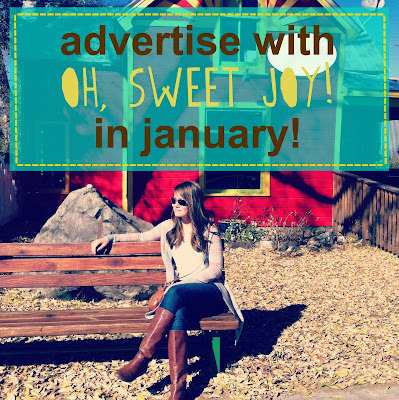 E-mail me (ohsweetjoyATgmailDOTcom) if you would like more information on advertising with us in 2012. I will send along an info sheet and answer any questions you may have. You won't regret it! Let's make 2012 the year your blog or handmade business booms, shall we?